Paley type 3 tibial hemimelia is distinguished by proximal tibia and a present knee joint, present malleolus, absent distal tibial plafond, and present tibio-fibular diastasis. The foot is in equino-varus and internally rotated relative to the knee. The talus is proximally migrated relative to the distal tibia. The talus is at the correct level relative to the distal fibula. The foot is repositioned by gradual distraction of the foot from the tibia using a circular external fixator. To prevent physiolysis of the proximal and distal fibula, a 1.5-mm wire is drilled retrograde into the fibula and up the fibular diaphysis to exit through the proximal fibular epiphysis. The wire is brought through the skin proximally and then bent backwards on itself to form a hook. A small proximal incision is made, and the wire is pulled back into the fibular head to lock into the proximal epiphysis. Distally, the wire is also bent 180°, then shortened and buried under the skin. This creates a temporary epiphysiodesis of the proximal and distal fibula to prevent physiolysis during distraction. One ring is applied to the proximal tibia with one wire and two half pins. The second ring is applied to the foot with three calcaneal and one talar wire. The equino-varus deformity is corrected by gradual dis-traction, then by repositioning the talus under the distal tibial epiphysis. Since the fibula is overgrown relative to the tibia, it does not need to be fixed to the distal ring. Its association with the talus and calcaneus causes it to follow the foot distally. 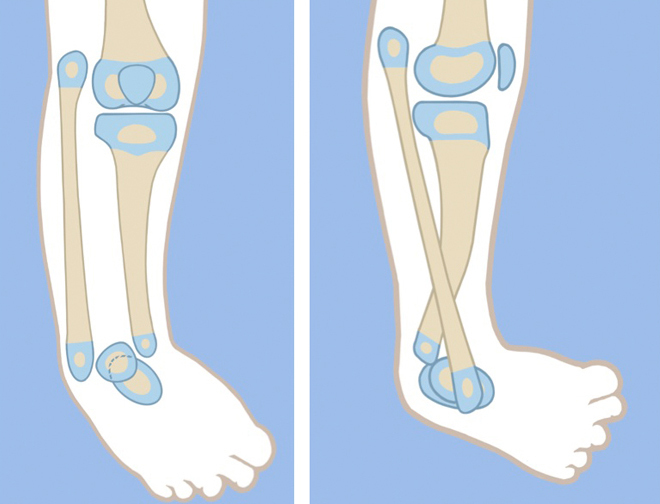 This moves the fibula from its relatively overgrown proximal position down to the normal station. 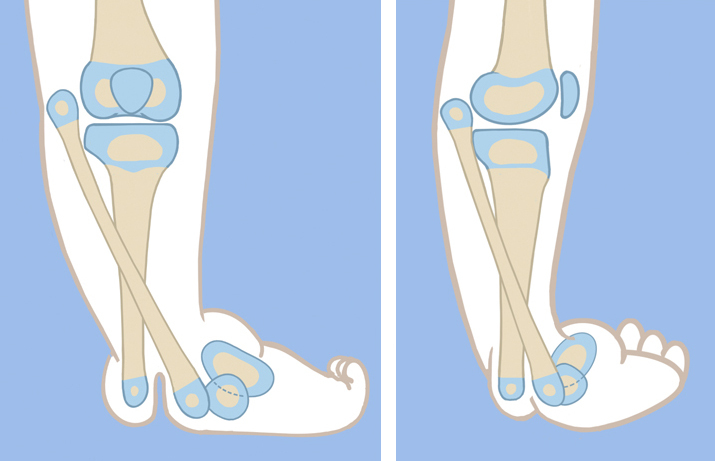 Once the foot is located under the distal tibial epiphysis, a planned second stage surgery can be carried out. The distal ring and wires are removed. The pin sites are covered by an occlusive dressing and the leg is prepped and draped free. A transverse incision is made on the medial side at the level of the tip of the medial malleolus. The tibio-talar joint is opened, and the distal tibia and proximal talus are exposed. The tibialis posterior tendon is located between the tibia and fibula, where the plafond should have been. It is moved out of this location to allow the fibula and tibia to come together. The tibio-fibular diastasis is treated next. This is fixed by using a syndesmotic suture system such as the TightRope® (Arthrex, Naples, FL), or the Ziptite™ Fixation System (Biomet Sports Medicine, LLC, Warsaw, IN). The syndesmotic suture with its two washers is used to reduce and compress across the diastasis. The distal end of the tibial epiphyseal cartilage is carved with a knife to the concavity of the tibial plafond, matching the convexity of the dome of the talus, creating a biologic arthroplasty. A retrograde axial wire, perpendicular to the sole of the foot, is passed through the dome of the talus, through the epiphysis of the distal tibia, and continues proximally into the tibial intramedullary canal. If the tibia has a varus diaphyseal bow to it, a percutaneous osteotomy should be made at the apex of this bow with an acute valgus angular correction, thereby straightening the tibia. The wire is advanced up the tibia to stabilize this osteotomy. The incision is then closed, and the foot ring is reapplied with three new wires. This helps ensure that the foot remains in a plantigrade position. The external fixator is left in place for 3 more months. The fibular wire as well as the transarticular tibial wire should be left in place even after fixator removal. The transarticular wire can be advanced into the calcaneus to allow for weight bearing. I prefer to leave both of these in place for 6 more months. This serves several purposes: prevention of fracture of the now osteoporotic tibia and fibula, stabilization of the ankle joint to prevent recurrence of equinus and retardation of the faster-growing fibula to prevent recurrent relative over- growth. Six months later, both wires should be surgically removed. A solid Ankle-foot orthosis (AFO) is used until the wires are removed, after which the patient is placed into an articulated AFO with a plantarflexion stop. Physical therapy to regain ankle range of motion is initiated after the transarticular ankle wire is removed. In this type of tibial hemimelia there is a cleft between the tibia and fibula in addition to the diastasis. The first stage of treatment is the same as for type 3A tibial hemimelia. The talus is corrected out of equino-varus and brought down below the level of the distal tibial epiphysis. The second stage of surgery includes syndesmotic repair between the tibia and fibula, biologic arthroplasty of the tibio-talar joint and closure of the skin cleft.